Arnold – Wont Be Back! Some of our dog walkers may remember the handsome Arnold. He was adopted 2 years ago and his brilliant owners sent us the following update. Arnie is our absolute best friend, we couldn’t imagine a life without him! He’s got such a lovely personality and is essentially a grumpy old man that is perfectly capable of showing his puppy side whenever he can get hold of a ball. When we first had Arnold, due to his background as a stray, we weren’t sure how he was going to get on with other dogs. We tried to take him regularly to a park near our house, which is well known in the local area for being good for dog socialisation. On lead at first, he was very well behaved and after some encouragement and support from fellow dog owners, we decided to try him off-lead. Needless to say, we had no need to be concerned! He is wonderful with other dogs, always saying hello very politely and enjoying a good play on occasion too (when he is not too busy chasing tennis balls – and yes, he always has to have two!). In the park, he is a bit like the ‘father-figure’. Eager to play for a bit with ‘the kids’ but mostly keen on just doing his own thing, occasionally intervening when he decides that play is getting just a bit too rough – particularly if there is a puppy involved. Over his 2 years with us, he has gained many doggy friends (some of which you can see in the pictures). His most frequent visitor, my parent’s dog Bane, is his mortal enemy/best friend – they don’t always see eye to eye but they are brothers at heart. Our neighbours thought Arnie was so pleasant, he twisted their arms into getting dogs of their own. 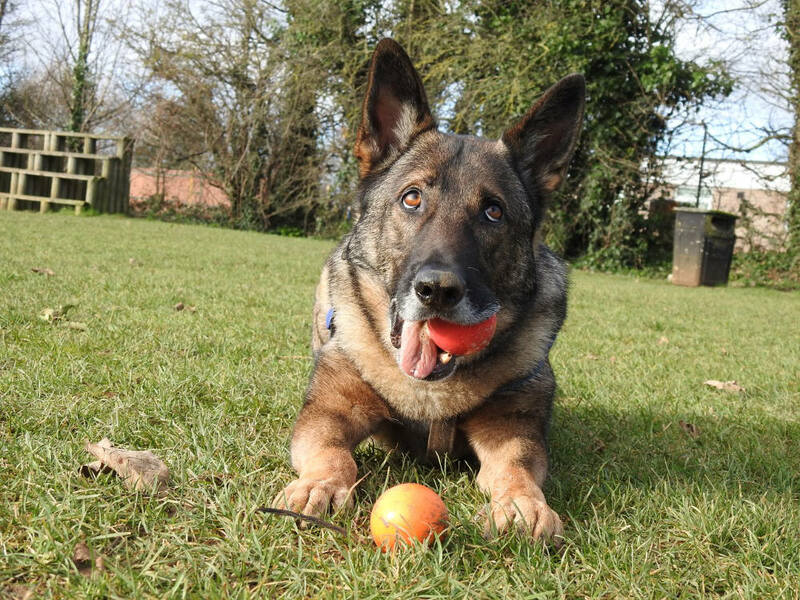 Now he has 2 german shepherd ‘wives’ just over the fence, both of whom adore him and try to kiss him daily – but Arnie likes to play hard to get! He is (mostly) very well behaved and has even spent a bit of time as an office dog, where he mostly sits quietly but occasionally likes to disturb everyone’s work in order to draw attention to any pigeons that he sees out the window – oh how he hates pigeons! Arnie played a major role in an important event in December, when Stuart proposed to me on a snowy dog walk (I said yes!) and then went on to star in our engagement announcement and the ‘save the dates’ for our wedding! Thanks so much to the Oxfordshire Animal Sanctuary, who were so accommodating, helpful and who cared for Arnold so much before he found his forever home! !